The helper of the day gets to be the teacher! 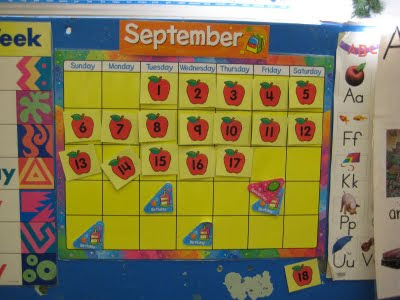 He or she stands beside the calendar and points to the numbers on the calendar and counts (with the rest of the class). As well as learning the numbers between 1 and 31, it shows students that we count from left to right and sweep back to the left and down a row when we get to the end of a row. It might sound easy to adults -- but at the beginning of the school year it has been confusing when we get to 5 and, WAIT -- where is 6??? Oh, there it is down there!! It takes a lot of concentration to say the numbers and point to the numbers with the pointer at the same time! The calendar will get a bit harder next month when there is is a pattern with the numbers. Check back at the beginning of October to see what this means! We talk about the days of the week, the month, the season and the year. The calendar also shows the passage of time and shows upcoming events such as birthdays and special school events. .